The bellwether examples of turn-of-the-century philanthropy by rich industrialists are the libraries created as a result of gifts by Andrew Carnegie. Over a 33-year period, Carnegie provided funds that led to the creation of 2,811 libraries around the world, including 1,689 in the United States. 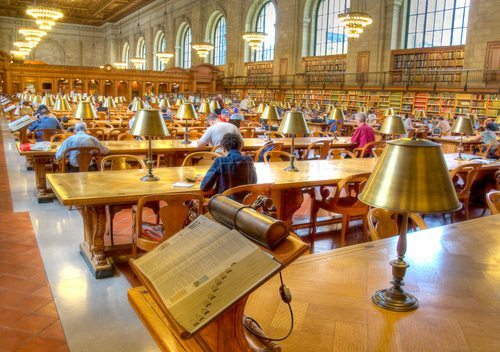 In New York City, there are 67 Carnegie libraries, built between 1902 and 1929, which were funded by $5 million from the steel magnate, though only 53 are still in use as libraries. The Carnegie libraries are often easily recognized by their grand architecture, but the City’s library administrators now see them as something of a burden, “costlier than others to repair, maintain and upgrade…[not] handicapped accessible, and their layouts don’t always service modern needs.” This WSJ article by Jennifer Maloney suggests that some in the various NYC library systems would like to sell some of the buildings; for example, the Brooklyn Public Library wants to put its Carnegie library in Boerum Hill on the market. The Library’s president and CEO, Linda Johnson, actually wants to sell two in order to pay for replacement library branches and pay for repairs on other buildings. The Brooklyn library system receives $15 million a year from the city for building maintenance, but Johnson estimates that deferred maintenance has already hit $300 million (the article says $300 million a year, though without any timeframe for how many years, that sounds like a mistake). The idea of selling off Carnegie libraries hasn’t been warmly greeted by community residents. Some suggest that selling off the libraries will lead to “an overall shrinking of public assets.” Others are fighting to retain and repair the libraries (the Boerum Hill branch needs $10 million in repairs just by itself) because of their architectural, historic, or just sentimental value. New York City’s Carnegie libraries are public assets, but they were designed and built for a different kind of library usage and library user than is perhaps typical today. Interestingly, on the New York Public Library webpage (there are three library systems in New York City), the three “greatest needs” identified as needing public support are its annual fund and general endowment, branch library programming, and exhibitions, showing a surprising lack of focus on the system’s deferred capital needs. The Brooklyn Public Library had established its own foundation arm in 1997 for “raising funds for special programs, services, resources and projects and in raising public awareness of the Library’s dependence upon private support,” but disbanded the separate foundation ten years later and brought all fundraising in house. The Queens Library Foundation still exists, raising money for programs such family literacy, after-school programs for kids, and resources for immigrants.